as well as cups, saucers, and bowls black pepper by Vera. 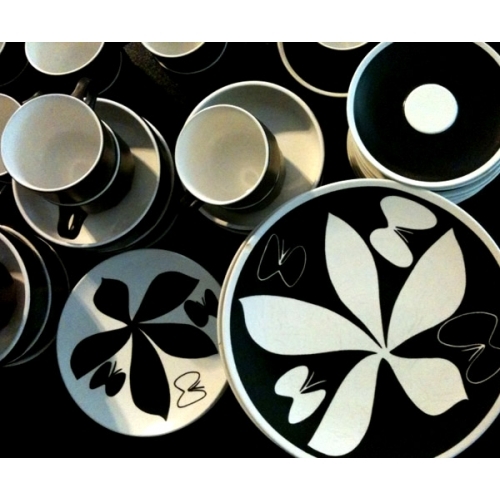 Matte black and white stoneware, circa 1960s, with enameled designs of flowers and butterflies. Dinner and dessert silhouette plates mix well with black pepper cups, bowls, and saucers all made in Japan by Mikasa. Who is Vera? An innovator and one of the most successful female entrepreneurs of her time, Vera built her company on a radical philosophy: fine art should be accessible to everyone, not just a select few. Known for her iconic images of cheerful flowers, trendy geometrics, and vibrant ladybugs, she believed people should surround themselves with beauty. "An artist never really finishes his work; he merely abandons it." "God is in the details." "All architects want to live beyond their deaths." "Engineering is controlling the forces and materials of nature for the benefit of the human race." "I have found among my papers a sheet . . . in which I call architecture frozen music." "Give me the luxuries of life and I will willingly do without the necessities." "I don’t believe in morality in architecture." "Colour is fun, colour is just plain gorgeous, a gourmet meal for the eye, the window of the soul." "Can anything be sadder than work left unfinished? Yes; work never begun." "A line is a dot that went for a walk." "Society needs a good image of itself. That is the job of the architect." "Good architecture lets nature in." "Creativity has more to do with the elimination of the inessential than with inventing something new." "The thing always happens that you really believe in; and the belief in a thing makes it happen." "The Key to immortality is first living a life worth remembering." "Greek architecture is the flowering of geometry." "Design is like gravity - the force that holds it all together." "Art is making something out of nothing and selling it." "Architecture should be dedicated to keeping the outside out and the inside in." "A harmonious design requires that nothing be added or taken away." "Design is not making beauty, beauty emerges from selection, affinities, integration, love." "Believe you can and you’re halfway there." "Everything is designed. Few things are designed well." "To create architecture is to put in order. Put what in order? Function and objects." "A design isn’t finished until somebody is using it." "The shortest distance between two points is under construction." "Art? You just do it." "The great thing about being an architect is you can walk into your dreams." "Yesterday’s the past, tomorrow’s the future, but today is a gift. That’s why it’s called the present." "No architecture is so haughty as that which is simple." "Clothes make the man, naked people have no influence in society." "Architecture is a visual art, and the buildings speak for themselves." "Art is the only way to run away without leaving home." "No amount of skillful invention can replace the essential element of imagination." "To draw is to make a shape and movement in time." "We shape our buildings; thereafter they shape us." "Art is an effort to create, beside the real world, a more human world." "In nature, light creates the colour. In the picture, colour creates the light." "The house itself is of minor importance. Its relation to the community is the thing that really counts." Architect's Rule, P.C. Copyright © All Rights Reserved.